Visiting a Christmas tree shop and purchasing a Christmas Tree is a family tradition in many American households. Often containing a variety of cut trees, shops are stocked with spruce and fir trees in shapes from short and fat to tall and skinny. Shops can be run by local groups, greenhouses, or larger businesses who service an entire area. Tree shops frequently open during the month of November for those who want to do some early decorating. Other popular times to open include the first of November, the day after Thanksgiving, the first of December, or a few weeks before Christmas. The best time to make a trip to the shop is when the entire family is home. 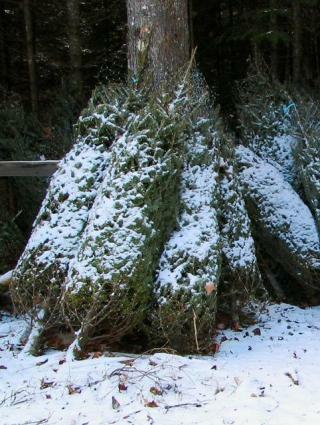 This may make purchasing your tree fall either early or later in the season, as schedules often collide. However, shops restock frequently in order to give customers the best selection. Avoiding the shop on Christmas Eve and possibly the weekend before is a good idea, as these are often extremely busy times. Weekends in general are often busier than weekdays. Try to visit Christmas tree shops during the week. If you want the best selection, find out what days the cut trees are brought to the lot, and make a point to visit that day. Have your measurements handy so that you know what will fit in the tree area of your home. You do not want to have to cut branches or the top of the tree off if there is a better fitting-tree for sale. Children should be dressed warmly. Sunglasses are another item to remember if the weather is sunny; snow can reflect sunlight into your eyes. Of course, the most important thing to remember is a camera. You will want a photo of the trip for a scrapbook or photo album. Have someone else take a photo of your family and tree to send out with your Christmas cards. A Christmas tree shop may also sell hot chocolate, coffee, cider, cookies, and other snack items to fuel you during your search.